When it looks fancy, it must take forever (or not) – Paleo Spinach Stuffed Chicken. You’ve invited that someone special over. You want to impress them with your culinary skills but can hardly boil water without boiling it away and scalding the pot (like we would know anything about that). This is one of those meals that not only tastes really (really) delicious, but it looks amazing and will surely score you some points as you’re maybe trying to “score” on a new level. (see what we did there)? The hardest part about this recipe? Butterfly(ing) the chicken breast and if you’re certain you’re going to screw this up, don’t be afraid to ask your grocer’s butcher to do it for you. 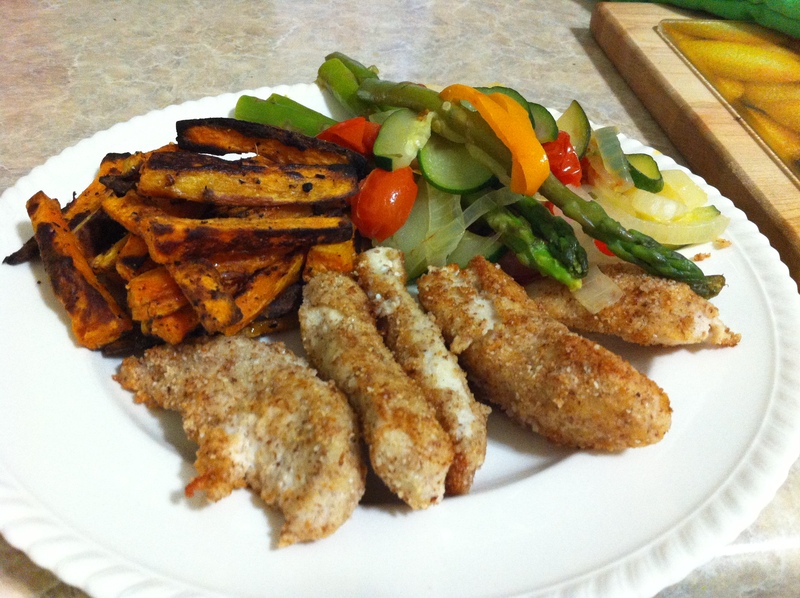 The original recipe comes from Budget Paleo and as always changes were made according to our tastes and preferences. A few readers have mentioned that it’s a little difficult to print out the recipe because of all the pictures (We do love taking pictures). One idea we want to try is putting all the pictures at either the beginning or end of the blog post and have the instructions clumped together so you can highlight and copy to a word document. Let us know if this works better / worse / didn’t really matter. Separate the bacon used to wrap chicken from the bacon used for stuffing. In a frying pan or skillet add chopped stuffing bacon and cook thoroughly. Remove and in same bacon grease saute garlic / onion / peppers until tender. Add spinach and cook until wilted. 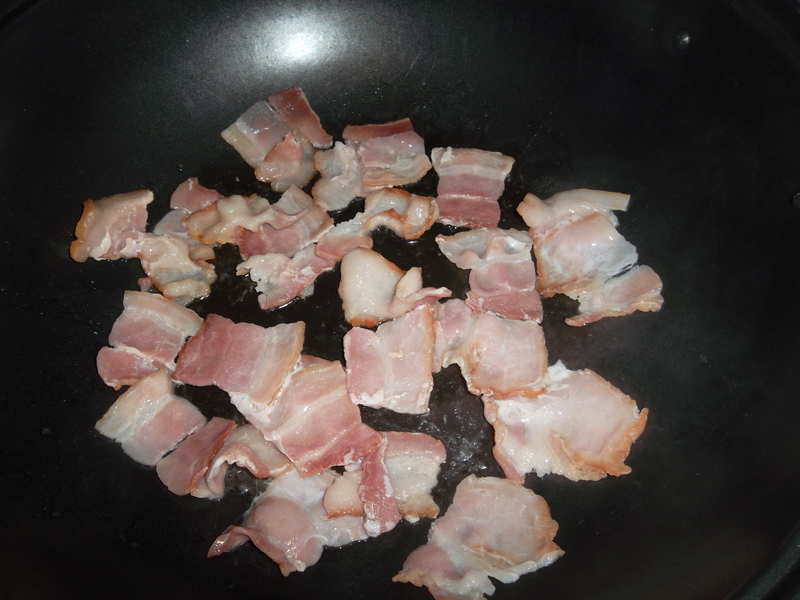 Return chopped bacon to frying pan and mix together. Remove from stove top while you prepare chicken. Butterfly each chicken breast and lay it on top of one slice of bacon (this will make it easier to wrap instead of waiting to wrap after stuffed which we didn’t do and it got a little messy). Spread bacon/veggie evenly on one side of chicken and then close up chicken breast. Wrap bacon around entire chicken breast and place in glass baking dish. Sprinkle with salt and pepper (optional). Bake (uncovered) for about 30 – 35 minutes. Increase temperature to 450 – 500F and brown bacon for about 10 minutes or until browned to your preference. This particular time we paired it with a simple vegetable so that the “fanciness” of the stuffed chicken really stood out. We’re not sure who we were trying to impress since it was just the two of us but whatever! With the upcoming Holiday season descending upon us (Canadian Thanksgiving, Halloween, American Thanksgiving and Christmas) we’ve been preparing ourselves for the onslaught of food that just seems to never stop. One of the things we’ve been talking about doing is going back to a strict 30 day paleo foundation. Some of you will remember we were using the hashtag #30daypaleo a while back as we proceeded to eliminate all dairy, all grains, all types of sweetener (including honey and maple syrup) and of course anything processed for 30 days. After the 30 days we introduced small amounts of dairy (greek yogurt and cheese) and some sweetners (paleo approved). We completed the 30 days with smashing success but as time went on we found ourselves introducing more types foods and many of them not paleo friendly (think desserts). We ate out more. We were more flexible about what went into our bodies and we can feel it taking it’s toll on us. But in reality it won’t be that much of a shift. We know what we’re doing. We know how to make our kitchen Whole30 friendly. We’re just hoping it helps curb our “outings” where the kitchens are not Whole30 friendly! 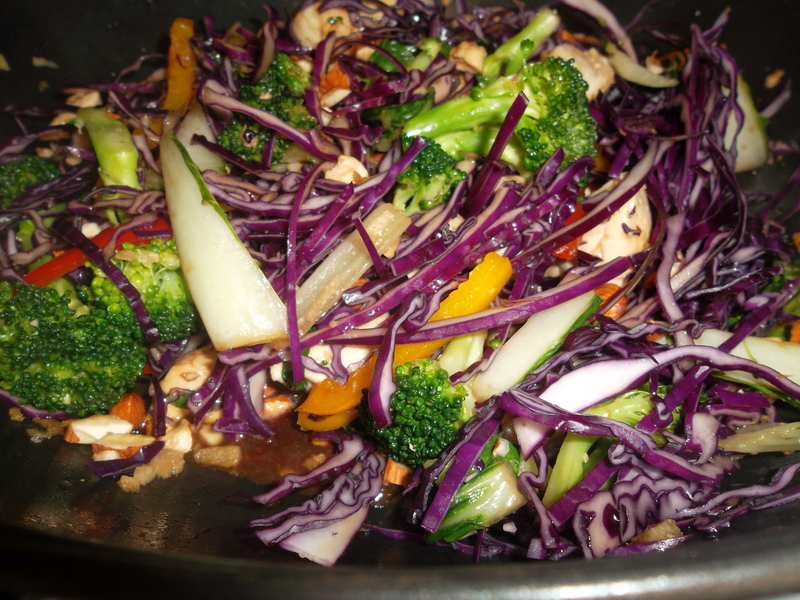 Below is the recipe for Paleo Pad Thai that we found over at Health-Bent. They listed this as a side dish but we took it a little further and made it into an entree by adding chicken (meaning we double up on most of the original ingredients). We also found that the “peanut” sauce was a little bland so we added one of our most favorite ingredients: Coconut Milk. And this is definitely Whole30 approved! Before you begin throwing everything in your saute pan, prepare those zucchinis. If you have a mandolin of sorts this will work best. If not then you can practice your knife skills by slicing into thin strips. Once those are done and off to the side, heat your FoC in a sautee pan over medium heat. 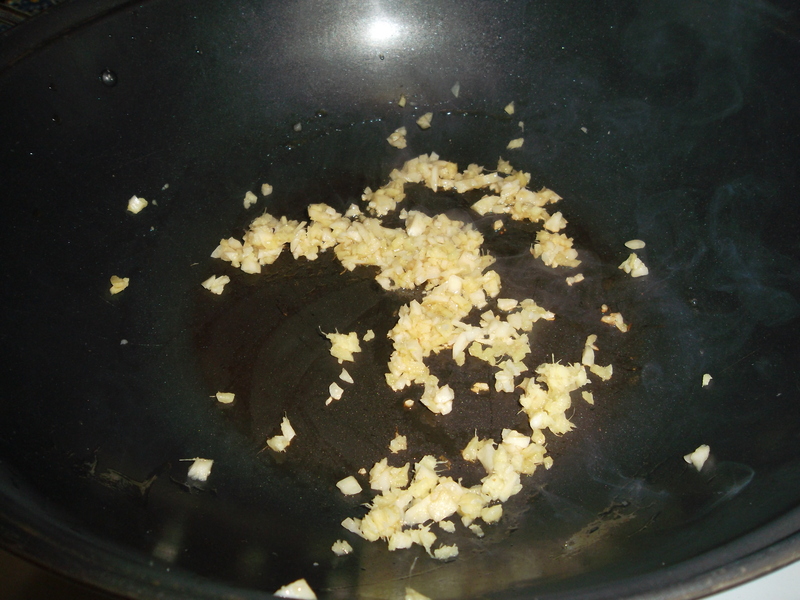 Saute garlic, ginger and onion for a few minutes then add chicken. 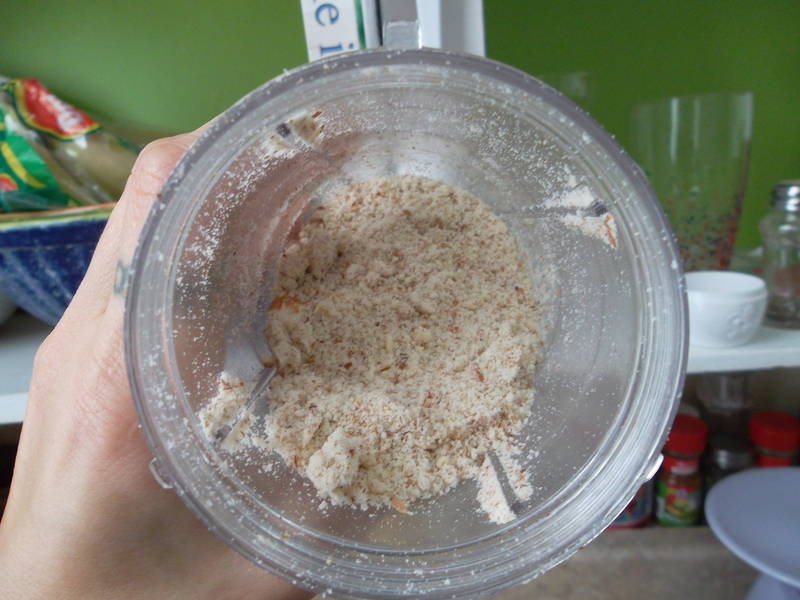 Once Chicken is cooked thoroughly, add lime, vinegar, fish sauce, chili powder, almond butter and coconut milk. 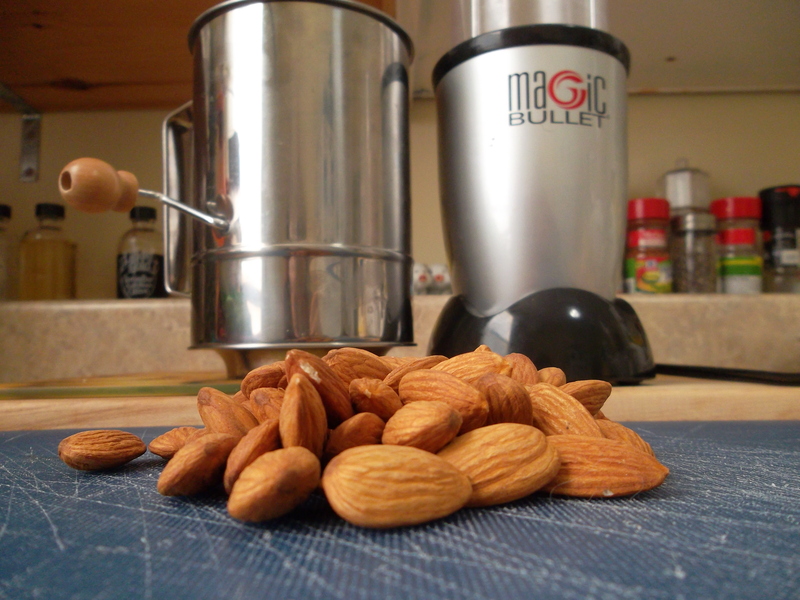 Heat on low so as not to scald the almond butter. Once a sauce like consistency add zucchini. Stir together and let cook for about 10 – 15 minutes (until zucchini is cooked to your taste – some like it more firm than others). You can serve this over quinoa or rice cauliflower but it was so filling we ate it with just a few orange slices (and it makes the plate look nice).. This dish will impress even the most anti-paleo of eaters! And if it doesn’t well that just means more for you! If you asked either of us what our favorite season is, almost immediately “Fall” would come from our lips and we’d begin to daydream about having to wear our favorite comfy socks, drinking tea out of our big clay mugs and most importantly breaking out the slow cooker on a regular occurrence. We’ve been so hectic with all the running (Tara is about to complete her 3rd and final marathon since May), traveling (We took a 2200 mile road trip down to Baltimore) and the Fitbloggin conference there hasn’t been much time for recipe research and even less time for recipe testing. Meegan just completed the six week “LightenUp” program and with it came quite the extensive meal plan so having to plan and execute (meaning take out the camera and document every.single.step) was not happening. But the running is coming to an end (at least those 26.2 mile runs). The traveling is now limited to drives to work and the parents house for long hours of card playing and it’s time to get back to doing what we love..
As always we believe strongly in a Paleo Foundation for our meal making at home and will continue to make that a main focus here on TheHDD. That being said we’ve both agreed to add small amounts of dairy into our menu (Tara loves her Greek yogurt and Meegan loves her Parmesan cheese) so you might see a few recipes “sneak” in that some would argue are not Paleo but no matter what your views are you can bet the recipes here are good for you and good for your tastebuds. Now break out that slow cooker and let’s get to making some delicious food! This is one of those recipes that is so easy you’ll probably find yourself wanting to make it over and over again. Nothing says Fall goodness like a delicious hearty stew. First thing first is prepare your vegetables. Peel and chunk onion/garlic (keep these separate from other veggies), sweet potatoes, parsnips, carrots (for heartier flavor leave skin on carrot intact, making sure to wash before cutting) and celery. When choosing your meat it’s best to use the darker meat of the chicken. It has a deeper taste than breast meat and there is no need to prep the thighs. Just layer on the bottom. If darker meat is not part of your palate, chicken breast will work fine just make sure to dice into large chucks before placing on the bottom of slow cooker. Add sweet potato, carrots, parsnips, celery and your dry spices. 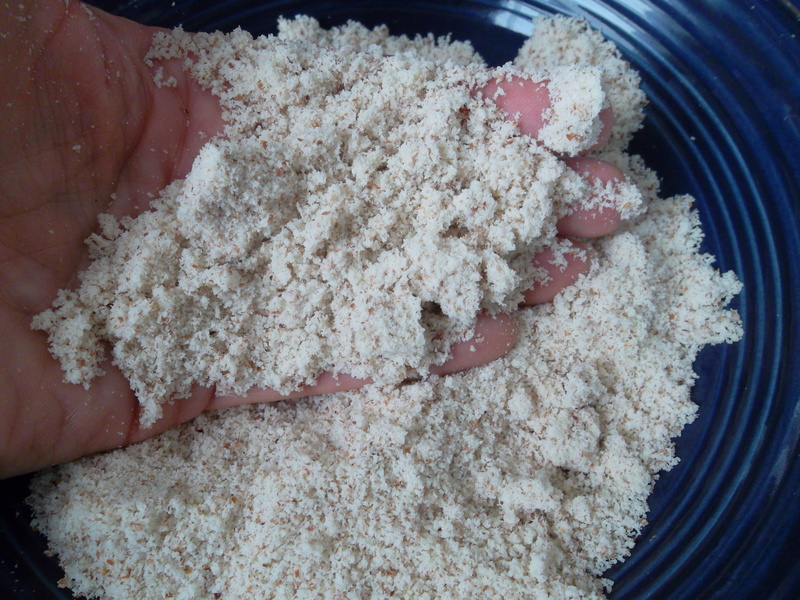 We used an Italian seasoning blend (just enough to dust the top). Pour chicken stock into slow cooker and cover on low for 6-8 hours. 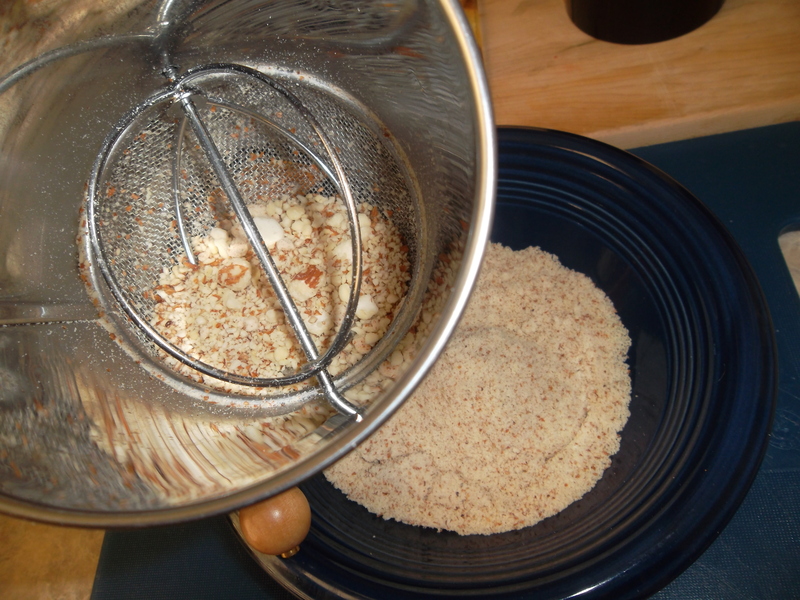 It’s been a few days since our last recipe post. Sometimes life gets in the way and you don’t want to take the time to photograph the meals that you cook. Or you do take your pictures but never get around to blogging a new recipe. The Paleo Orange Chicken is indeed paleo and the original recipe can be found over at Health Bent (which is quickly becoming one of our favorite go to paleo blogs). We added the rice because Tara is slow to give up the grainy goodness. 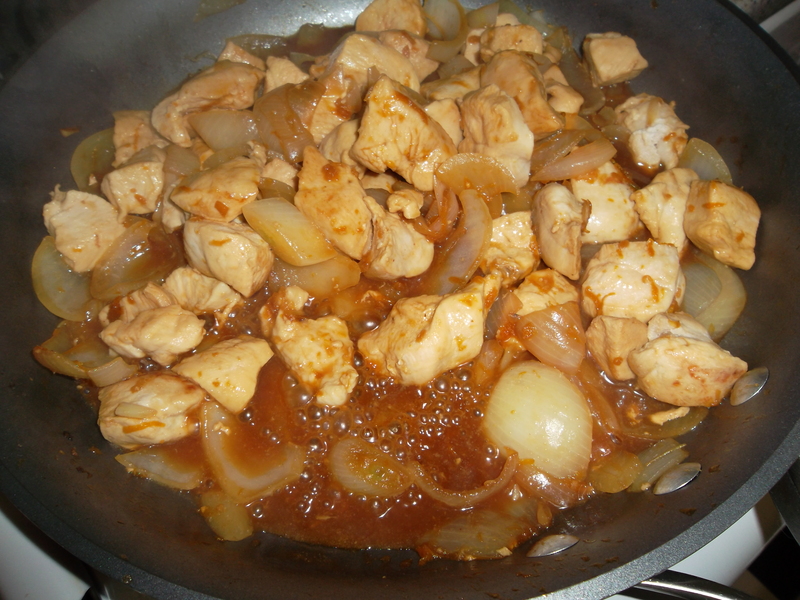 We didn’t change up the recipe too much except we substituted garlic cloves for chili garlic sauce and added diced onions. 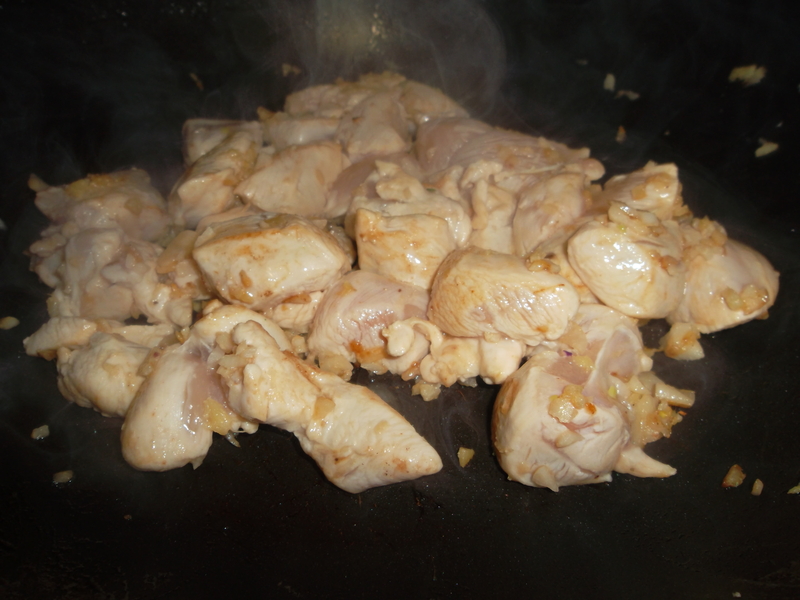 In pan cook onions and chicken (with your FoC) until onion is tender and chicken is cooked thoroughly. While cooking you can prepare the orange sauce goodness! 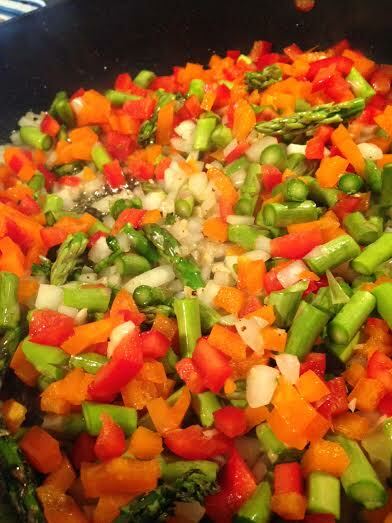 In medium sauce pan, add orange juice, orange zest, ginger, soy sauce and garlic. Simmer to reduce while chicken is cooking. Here comes the hard part! When the chicken is cooked and browned to perfection add to sauce reduction. 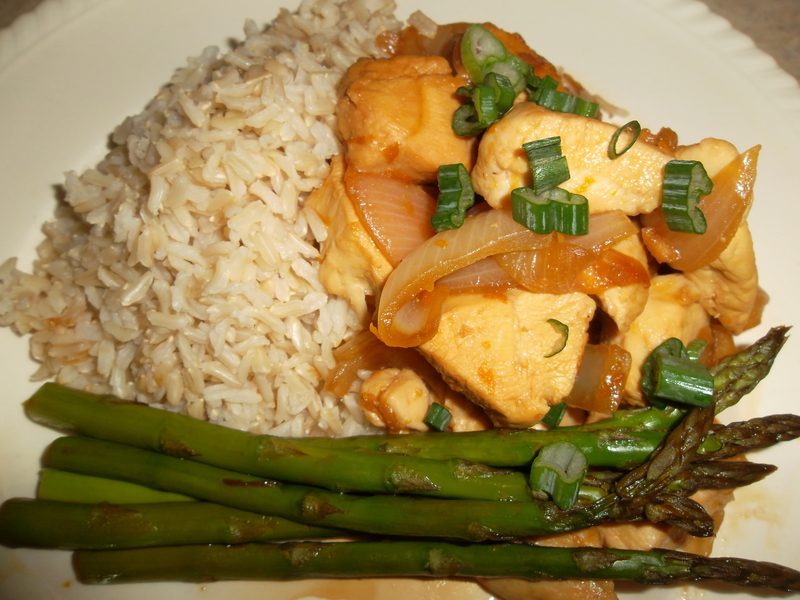 Garnish with green onions and get to eating! 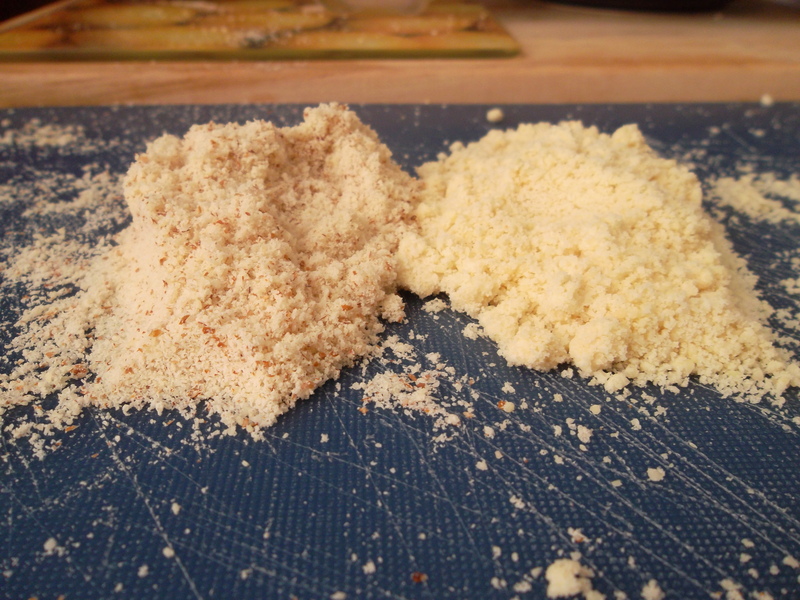 – Side note: If you want to have more of an orange “coating” then reduce your sauce even more. This will also create more of a crispy coating on your chicken. We thought the reduction was perfect and loved the lightness of the orange.